Lunchtime is High Noon for the service industry. Cafes, sushi joints and chain restaurants come out all guns blazing in the hope of collaring the nation’s working men and women. But no sector is more competitive than the sandwich shops, from independent traders to image conscious franchises. Once upon a time the sandwich shops were all about, well, sandwiches. That unremarkable edifice of two slices of bread encasing a filling, often of indeterminate origin, was the undisputed king of street food. These days its reputed inventor, John Montagu, may well be spinning in his grave at the sight of the interlopers that have made his snack seem more than a little curled up round the edges. Now, everyone wants a sub or a baguette; or in the case of the Italian contenders in this catering version of Jeux Sans Frontières, a ciabatta or a panino. 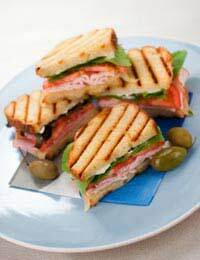 Or is that panini? Well, one is a "panino"; more than one, are "panini", as any self-respecting GCSE student of Italian would be only too happy to confirm. As would, for that matter, any first-second-or- whatever-generation Italian running their own cafe or delicatessen. Not so the many pseudo-Italian establishments. And not so, understandably, their customers who, in a flashback to schooldays, take their lead from what is written on the blackboard. Unfortunately, taking liberties with the Italian language doesn’t stop with the humble bread roll. The toasted antipasto that is bruschetta is another favourite for serial offenders. In this case, the problem is more of pronunciation than mixing up singular and plural. The ‘sch’ comes out as a soft ‘schhh’, when it should be a hard ‘sk’ – repeat after me ‘brusketta’. But there are much worse efforts – the narrator of MasterChef Australia recently referred to the loveable little toasties as ‘bru-sheeetar’. Cappuccino suffers even more from the lazy efforts of board writers, who appear to imagine the tick-tock of the Countdown clock eating away at the 30 seconds allocated to place the jumble of letters – how many c’s and p’s are there again? – in to their correct order, and panic in the process. And it’s surely a safe bet that they will be enquiring of their customers as to whether they fancy a post-prandial cup of ‘ex-presso’. From there it’s only a matter of time before this linguistic laziness extends to menus bearing such legends as cannelloni beans. Point taken? More to the point, does any of this matter? Do people really need basic Italian in order to enjoy the food? No, of course they don’t. Should front of house, whether they be running a relatively humble sandwich shop or a restaurant with big ideas? Most definitely, yes. In common with the culinary traditions of other nations, serving outstanding dishes is about getting the small details right. Surely it isn’t too much to ask that such details include respecting the language whose richness is reflected in the recipes that have attained the status of international classics? The names should roll off the tongue with the same ease that the food disappears from the plate. At the very least it would prevent another poor soul plumbing the depths reached by a British tabloid journalist covering Italia ’90, who breathlessly informed his readers that England football fans had clashed with the carbonara. One suspects that the signs of battle were a little more serious than a few broken eggs and the odd string of spaghetti hanging from the lamp-posts.